Isreal showed up right on time as usual. 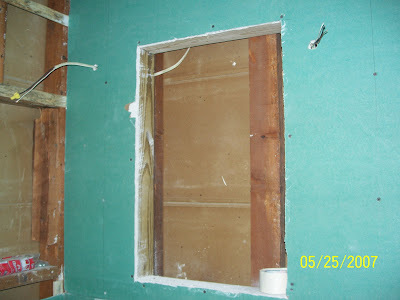 He got right to work and put up the sheet rock and cut the whole for our medicine cabinet. He also talked to the electrician and got an "ok" to get the wiring done for the light fixtures on his own. I guess they weren't going to be able to fit us into their schedule until late next week... and it was a 5 minute simple job. So... that's done. 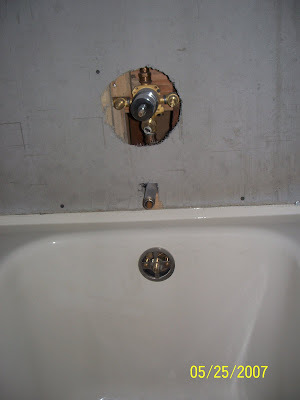 In other news... you would never guess what is in our bathroom!!! Can you believe it??? It's a tub! In the bathroom! Not in the living room! How great is that!!! The plumbers showed up for a change. I will say they were about an hour later than they promised Isreal. But... they showed up. They got to work. 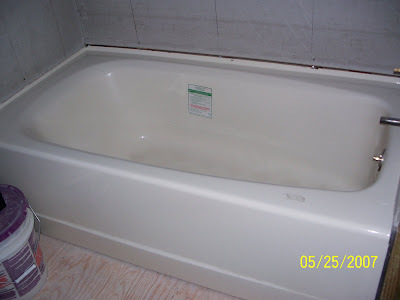 In less than 4 hours they had that tub in place and completely functional. Yippee! Hooray! WooHoo! 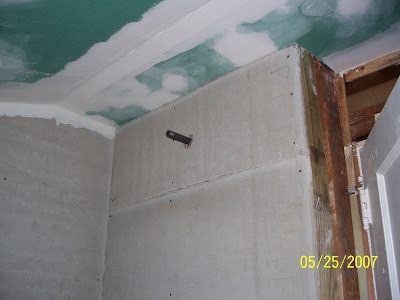 You can see in these pictures that the fixtures aren't on... but the pipes are all in place. Tile will go on before the fixtures. But... the plumbers aren't needed for a while. 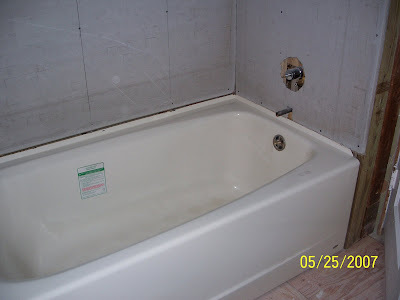 You can also see in the pictures that the moment the plumbers were done Isreal not only started putting up the cement board in the tub area... he finished it. He is amazing. 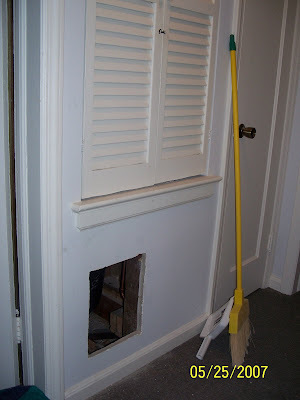 The only unexpected event today... the plumbers needed to put this hole in our hallway wall so that they (and we) would have access to the pipes and shut off valves. Isreal explained that he can put an access panel door there and paint it the same color as our wall. Not really a big deal. I'm just going to have to find something heavy to cover that hole up in the mean time. It seems to be just the right size for Zoe to crawl through.... and I'm not waiting to see if she notices that.